MTA boomerangs: how they hover? Let´s start with the basics: a boomerang wing, like an airplane wing, can generate lift as it moves through air, or, equivalently, as air streams around it. Lift depends on the pressure difference between the top and the bottom of a wing as it moves through air. The physics behind the lift generated by a wing profile is complex. The Bernoulli theorem and the fact that air streams supposedly faster on the top of the wing than on the bottom hence inducing a pressure difference is only a small part of the story and does not explain it all. The amount of lift produced by a wing depends on its shape, total surface, angle of incidence (angle of attack) and the speed of the air around it. Air density is also important but let’s ignore it for a moment. To be precise, when the wing is moving through the air, a small amount of air remains attached to the wing surface and actually changes the shape of the airfoil. This tiny layer situated close to the surface is called the boundary layer, it affects the whole airflow. In fact the airflow reacts to the boundary layer as if it were part of the solid airfoil. The lift generated by a wing is proportional to its area, so that larger surfaces lead to higher lifts. This concept was widely applied in MTA designs in the late 70s-80s; the MTAs had massive wing areas in order to compensate the heavy weight of those boomerangs. The total mass of the MTA is obviously an important factor, as a heavier boomerang is pushed to the ground with a stronger weight force. So we can go for lighter boomerangs and hope for longer flights. Jonas Romblad made some beautiful ultralight composite MTAs that in some circumstances rewarded the throwers with mesmerizing flights. The thickness of the MTA might seem like a secondary player since it is not immediately related to the lift produced by the MTA wing, but it’s one of the characteristics of the wing profile. The efficiency of a profile in generating lift also depends on its thickness but not in a straightforward way. The boomerang thickness is however very important. The drag, the force that slows down the wing as it moves through air, depends strongly on the profile thickness. The aerodynamic rules for calculating the lift on thin airfoils establish that the lift is directly proportional to the angle of attack: a larger angle (positive) gives a higher lift, a smaller one (or negative) gives a lesser lift. This is true in the range of +/- 10 degrees. At a high angle of attack, the boundary layer detaches from the wing surface and can cause serious disturbances and lift loss. This phenomenon is known as stall. The stall is dangerous for airplanes and might be one of the causes of unstable MTAs. What is the relation between the sinking speed (the speed of descent) of a hovering MTA and its characteristics (weight, surface, thickness, etc.)? Carl Morris, an American MTA enthusiast, did some interesting measurements on different MTA models. He measured the wing area (total surface of the boomerang), the weight and the thickness. He then tried to find a correlation between the wing loading (weight of the boomerang divided by the wing area) and an estimation of the descent. For some of the models he considered, a correlation was found: less wing loading lead to better hovering. Some other models, in particular phenolic MTAs, did not confirm the rule. 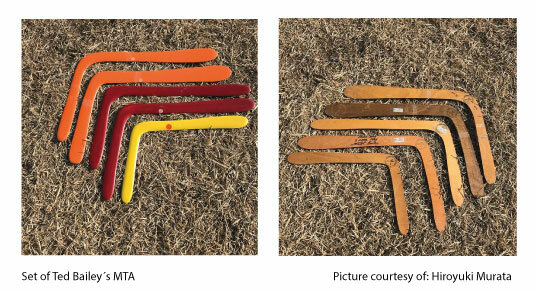 Thin and/or heavy boomerangs tend to spin at higher rates and might generate more lift, so things are more complicated. More wing loading (heavier weight) means more weight force for a given total boomerang wing surface: so lighter should be better! At the same time a higher wing loading leads to more spin, hence higher airspeed thus more lift. How the sinking speed depends on wing loading is not clear. Boomerang with small wing loading tend to hover better, but it not always the case. To have some numbers let’s consider two examples: a Ted Bailey Plywood Mta weights around 38g, with approximate wing area of 174.8 sq cm, a Jonas composite weights around 18g, but have a smaller wing area of 116sq cm. Jonas composites have a lower wing loading they seem to better for a reason! Well, not all the Jonas hover the same although they all have the same wing loading and not all the Ted Bailey MTAs (or wooden MTA) are worse than any Jonas. The tuning of a boomerang, we all know it, is very important too! 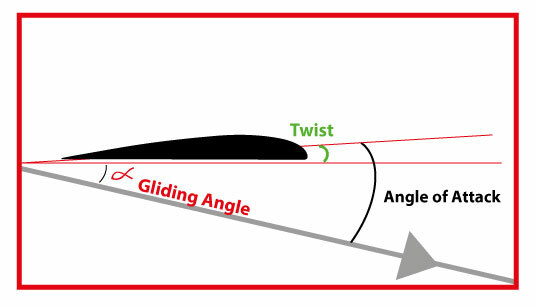 Changing the angle of attack, for example has a high impact on the ascending part of the flight, but also on the hovering. An extreme angle of attack, either positive or negative can be great for the ascending part of the flight and bad for the hovering and vice-versa. While most of the boomerang throwers are quite skilled in tuning a boomerang to get a correct flight, finding the good solution for a stable hover is very difficult. It’s reasonable to expect that, while hovering, an MTA “adjusts” automatically to a sinking speed and spin rate such that all the forces: weight, lift, and drag of the profile reach an equilibrium. Something more complicated of what happens to a descending parachutist: the forces of weight and drag of the parachute through the air, reach an equilibrium and the descent is at constant speed. The equilibrium for a hovering MTA is achieved via a change of the spin rate and sinking speed that indirectly change the angle of attack of the wing streaming through the air. Lift-Drag-Weight reach an equilibrium at a certain optimum angle of attack and speed of the air. To get some deeper understandings we need to study the “real” angle of attack of an MTA wing during hovering. This is a bit more complicated and needs some more text. Article by: A. Palacio, M. Schütz, A. Sgattoni.